Not all prog rock was synth noodling. Sure Keith Emerson brought monstrous analog synthesizers into the studio and on stage, moved around the cables, and made all kinds of weird and wonderful noises when Emerson, Lake & Palmer became musical sensations. 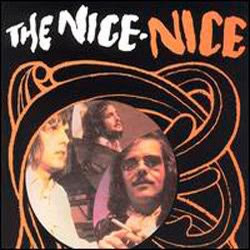 But before ELP, Emerson led the late 60's trio The Nice, where he mainly stuck to pianos and occasional Hammond organ. The Nice were definite precursors to ELP, mixing rock, free jazz and classical genres, sometimes to bombastic but not elaborate extremes. They took particular joy in morphing classical, jazz and folks songs into their own updated arrangements, adding a driving rock beat, jamming on a chord progression, and sometimes turning the original into something unrecognizable. Like Yes, they turned Leonard Bernstein's "America" from West Side Story inside out. Dave Brubeck's "Blue Rondo A LA Turk" was sped up, changed to the rock standard 4/4 time, and distorted. Somehow I fell into possession of The Nice's third album (I think one of my limousine driving neighbors gave it to me), simple called Nice, around the time it came out. I only listened to side one, three melancholy songs followed by the 8-minute musical rock/jazz sound collage "For Example" which I remember during the whirlwind climax featured horns playing the opening notes to "Norwegian Wood." The album's second side consisted of two live recordings, the aforementioned Brubeck cover (now simply called "Rondo '69") and a completely lunatic reworking of Bob Dylan's "She Belongs To Me." The album's opening number, "Azrael Revisited," set off the mood with a sinister dissonant piano riff accompanied by a snapping drum beat and relentless cowbell, all the better for a song about the angel of death, right? As if death wasn't grabbing enough for a curtain opener, then came the rather poetic two-faced cover version of American folk singer Tim Hardin's "Hang On To A Dream." Ostensibly a simple song about being left behind by your girlfriend and hoping for the best, leave it to Emerson and company to turn it into something far more complicated and unexpected. Emerson was always about as subtle as a sledgehammer and seemed to delight in showing off not only how amazingly fast he played, but that he could do it in nearly every genre. And just in case you didn't get the point, he would simply mix in a few genres in the same song, whipping off everything with lightening speed. Tim Hardin's "Hang On To A Dream" is a beautiful stark song, and The Nice's rearrangement manages to retain that beauty yet gassing it up into something you'd hear in a Balinese temple. Emerson is all piano flourishes and classical riffs. Vocalist Lee Jackson sounds mopey and crackling, especially when he stretches out "she says what she do-o-o-o-o-oes." A little triangle for the emotional touch, a holy choir for the choruses, and a cello for the chamber effect. Really nice, really pretty and actually moving, and then suddenly Emerson breaks into a series of major jazz chords for no apparent reason and boom, the Nice has shifted into rocket bebop mode, Jackson's electric bass now pumping double time, Emerson racing up and down the piano, a tambourine hitting the quarter note beats, and the song is now off to the races. This break comes to a dramatic climax, and then Emerson gives one of his patented classical downward spirals, a very brief pause and a Chinese gong is smashed, cue choir. Below is a very entertaining black and white video of The Nice performing "Hang On To A Dream" live on the Beat Club television show. No choir, but you can see Emerson was clearly in charge, nearly overpowering everybody else on stage, even plucking the piano strings at one point. You can barely hear Jackson's low-key singing. The jazz break in this show goes on far longer than the album version, but Emerson is pretty much unstoppable and a certified madman.